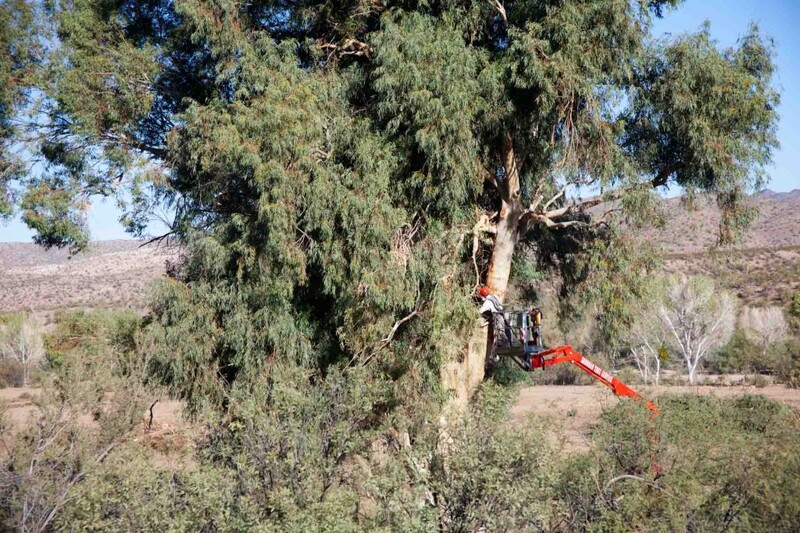 Last fall we had the chance to work with the BLM at Palmeritas Ranch doing work on some large non-native trees. 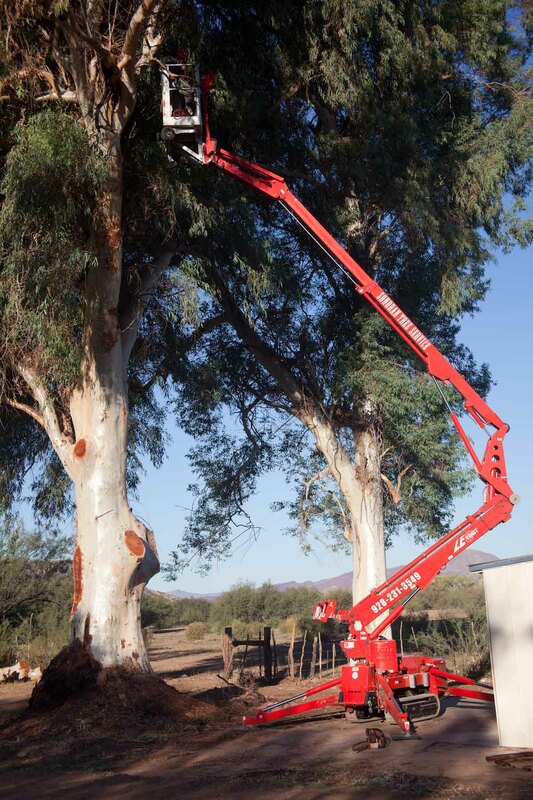 Huge Eucalyptus and Salt Cedar (Tamarix sp) trees had been planted early in the history of the ranch. These trees were historic in and of themselves, but were a threat to the historic ranch buildings which are being restored. We met with BLM personnel and decided to re-top the Salt Cedars so they would pose no further threat (with regular maintenance). We decided on removing some of the most dangerous limbs on the Eucalyptus trees and then just thin and clean them of suckers and deadwood. 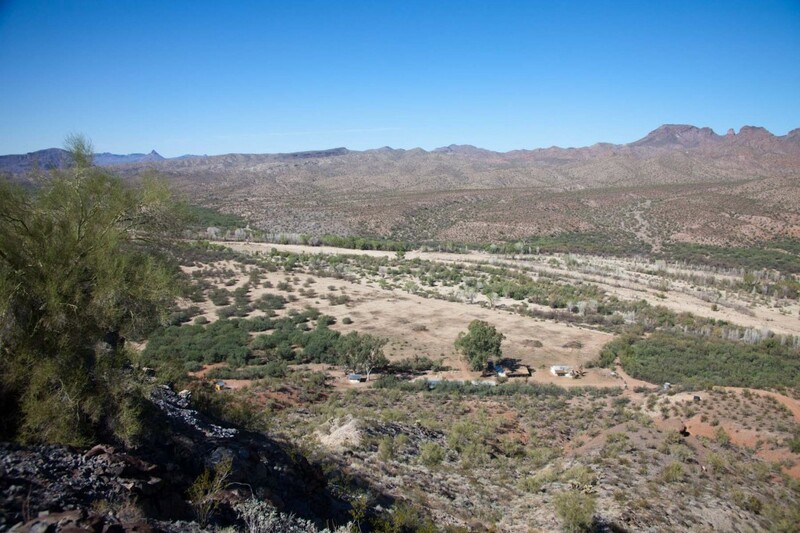 The journey from Wickenburg takes several hours (with trailers) so we planned to camp overnight and work two days. We enjoyed our time at the ranch and I wanted to share a few pictures that I took during our stay. 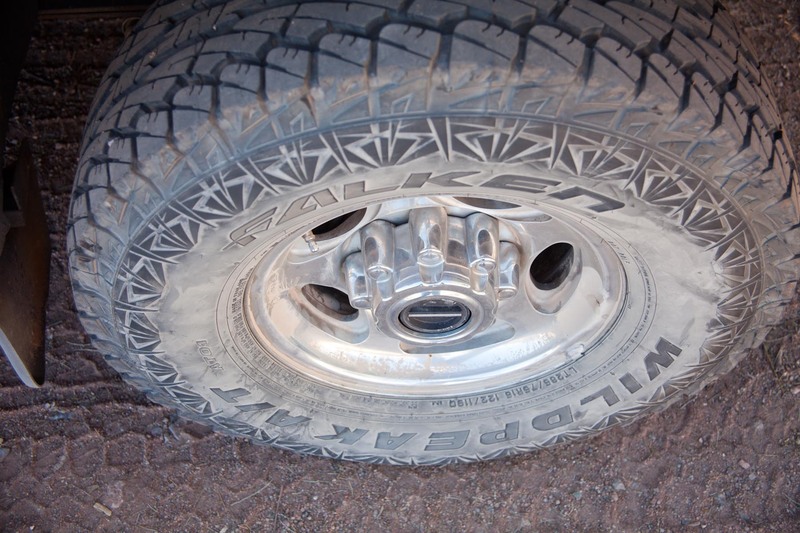 Mud Tires on the Truck to help get in to the ranch – Super Dusty! 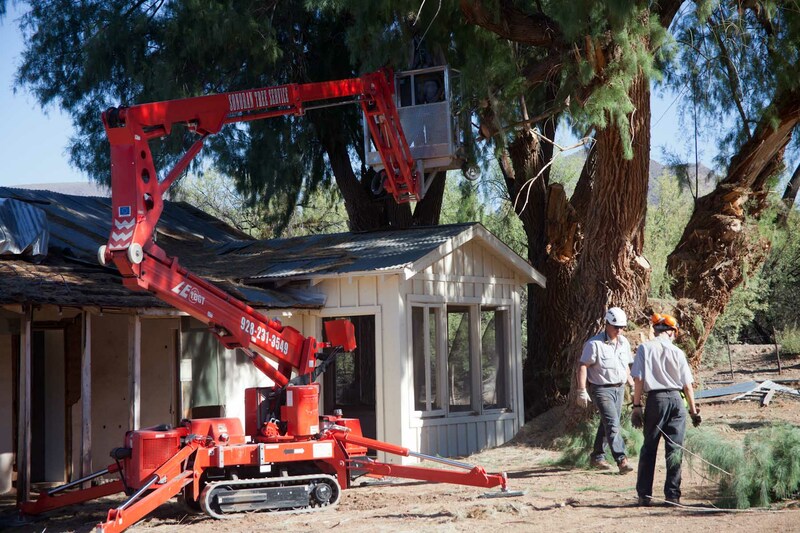 We needed the lift to work on these huge trees. The road down the bluff is steep and covered with loose rocks. We were fortunate that the BLM personnel had a backhoe on-site in case we needed a boost to get back out! 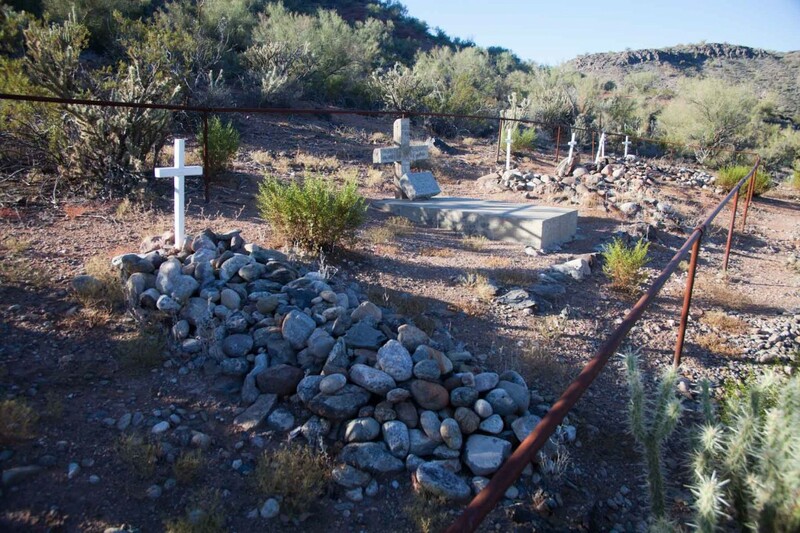 The old cemetery is located up the side of the canyon just to the south of the ranch buildings. There is a pipe fence around it to offer some protection from livestock. 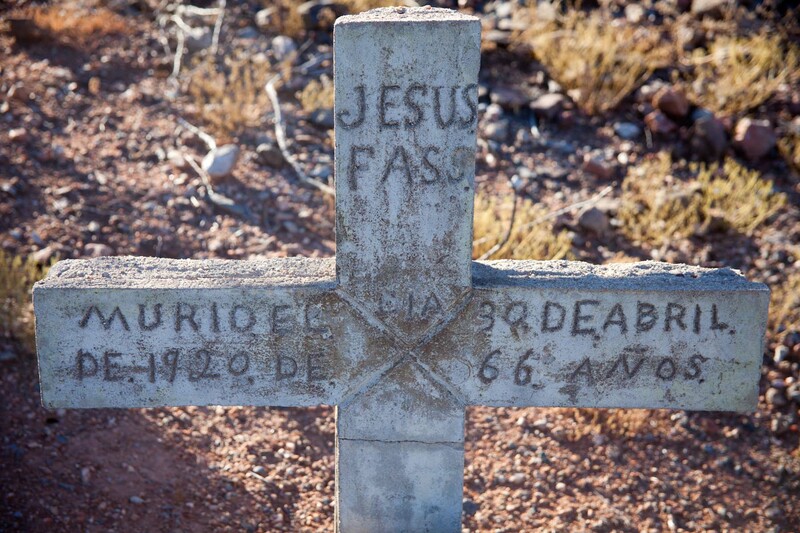 Grave marker for Jesus Fass, one of the early inhabitants. 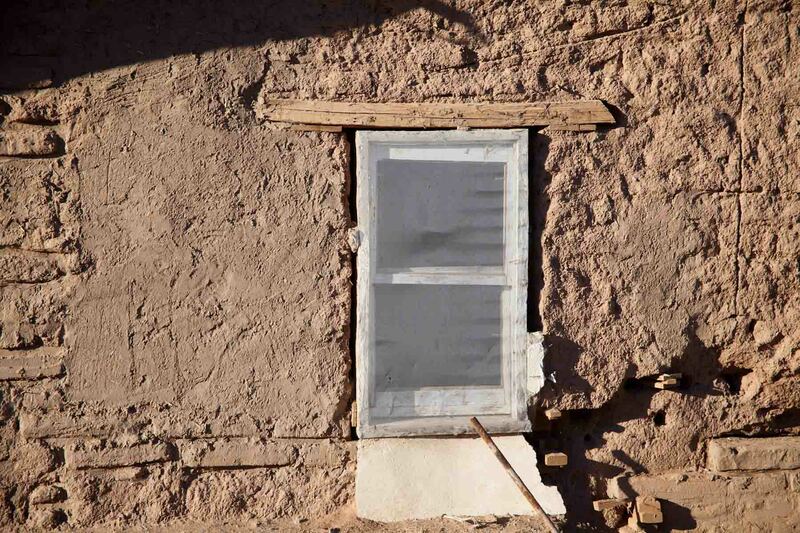 The guys from the BLM love this place and spend a lot of time working on restoring the buildings using appropriate technology. 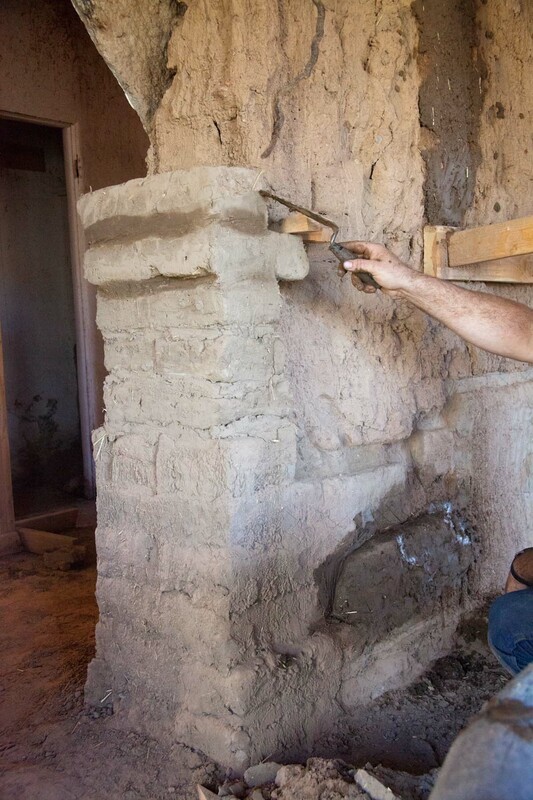 They were telling us about proper adobe construction techniques and demonstrated some things to us while we were there (after hours of course!). 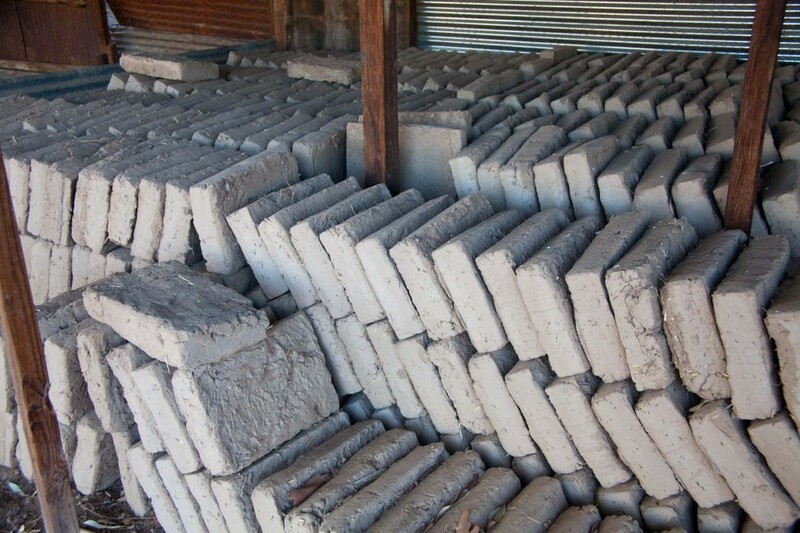 You have to be patient to work with adobe, just a couple blocks at a time or the mortar (mud) with squeeze out! 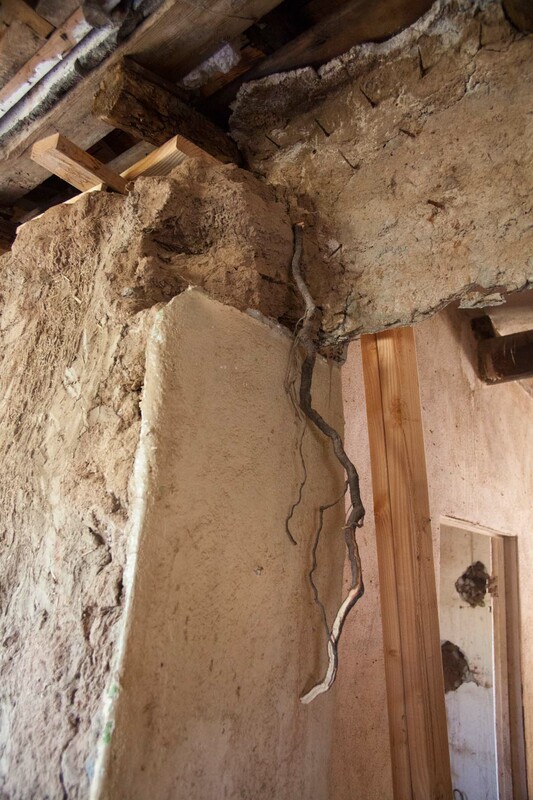 Here is a Mesquite Tree root that was found growing inside the wall of the adobe house! 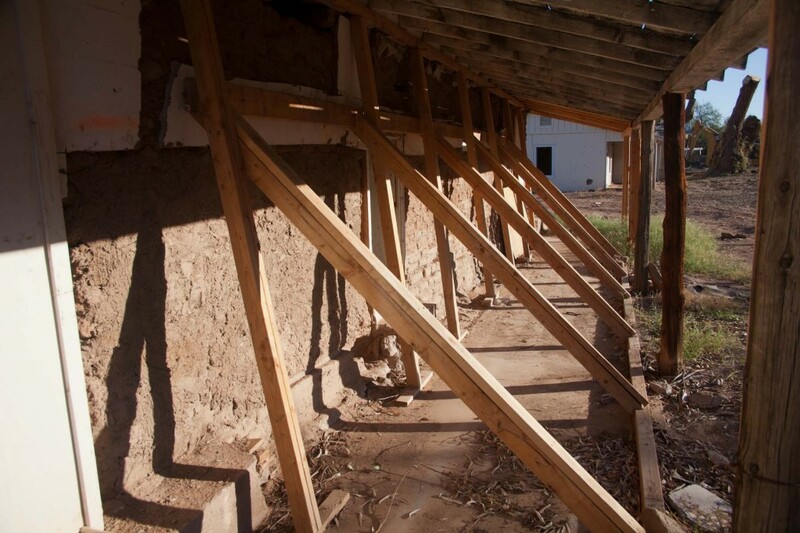 There are many areas where the original adobe construction is in pretty good shape, but there are also areas where a lot of work needs to be done! It would have been faster to demolish all the structures and start from scratch, but since these are historic buildings everything that can be preserved, must be preserved. A view from the top of the canyon showing the area where we worked. A view downstream along the Santa Maria River, the Arrastra Mountain Wilderness on the right. The confluence with the Big Sandy River can be seen in the distance. 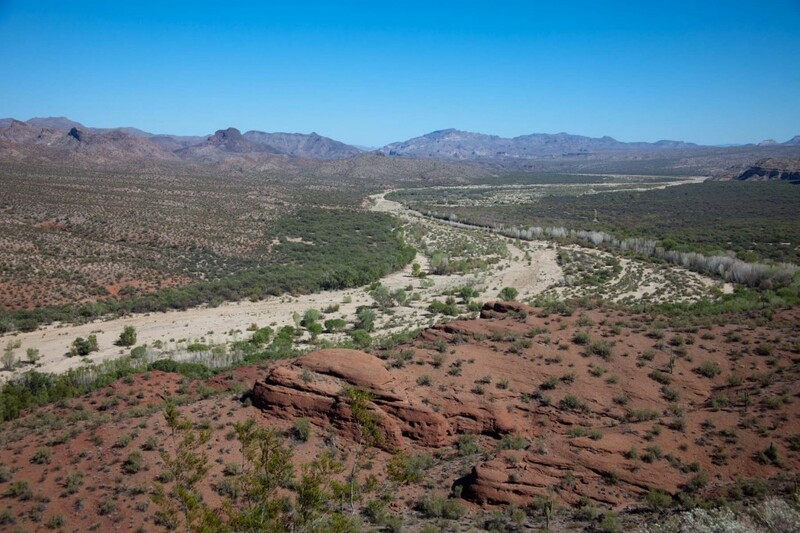 A view from the top of the canyon above the ranch buildings looking upstream (east) along the Santa Maria River. 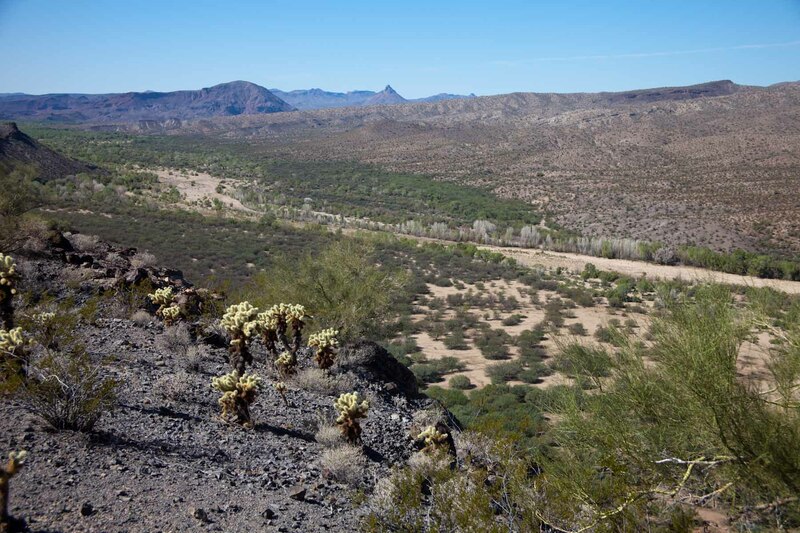 The Arrastra Mountain Wilderness is on the left. The long (and dusty!) road home. Palmeritas Ranch can be accessed by taking the Alamo Lake Rd north from Wenden. Turn at the sign for the Wayside Inn as you get near the lake, and follow Palmeritas Rd east from the Wayside. 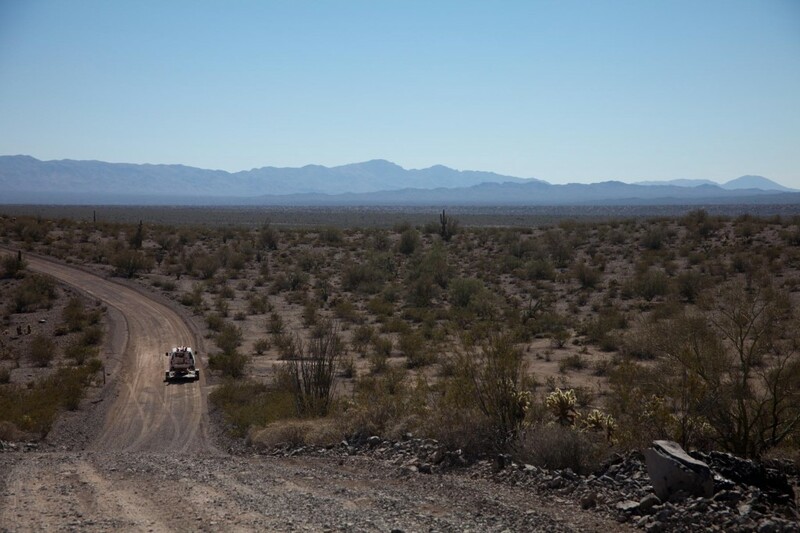 Vehicular traffic is not allowed in the wilderness area to the north of the ranch, so this area would need to be explored on foot. I would recommend a 4×4 vehicle, as the road down the bluff above the ranch buildings is steep and covered with loose rock. The road from the Wayside Inn to the top of the bluff is pretty good, just a few washboards and soft sand in some wash crossings. There is a pretty modern pit toilet located to the west of the historic ranch buildings. Water (labeled as non-potable) is available at the ranch. 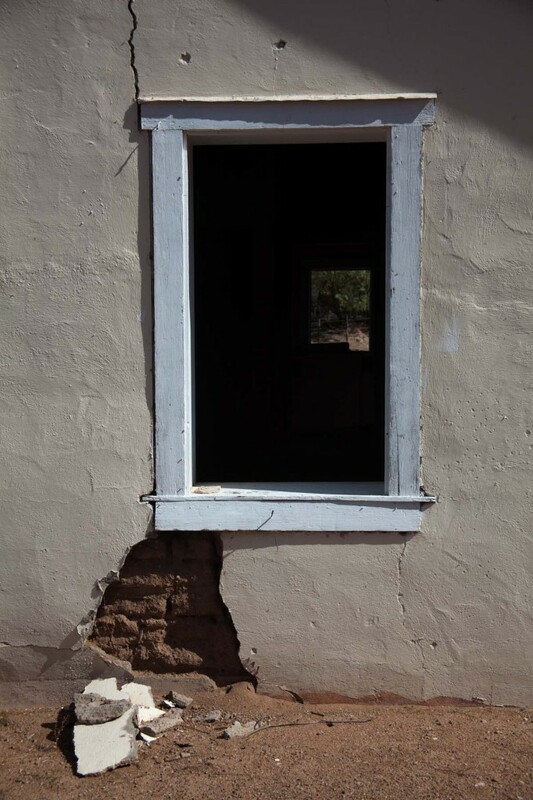 If you visit, please respect the work that has been done to these historic buildings! Very interesting Paul. It looks like a beautiful place! Hi, been reading your blog with great interest for months , thanks for the insight! I live in Joshua tree , Ca. I transplanted 3 trees last august, 2 are doing well but 1 is struggling. The happy trees are a 7′ deodor and a 4′ aleppo. The struggler is an 8′ aleppo that looked fine for the first 2/3 months but is getting browner and browner needles. I dug the trees out from another desert property getting as much root ball as possible- about 18” – 24” long roots on the struggler. I followed the planting and watering techniques you recommend. The soil is quite sandy. I watered 2x week at first, then every 5 days in the fall, once a week since the winter. All the trees have wide water wells. Thank you for your time and support on behalf of my family and I.
I will contact the BLM Kingman Field Office. This is an ebook and can be viewed or purchase online for about $3.